BROOKINGS, S.D. – A near-record strong El Nino has brought warmer than average temperatures to South Dakota throughout December. According to the National Oceanic Atmospheric Administration's (NOAA) Dec. 17, 2015 Climate Outlook, the trend is forecast to continue until spring 2016, said Laura Edwards, SDSU Extension Climate Field Specialist. "Several records have already been tied or broken this month, with high minimum temperatures across the region," Edwards said. Statewide approximately 59 new daily records were set between December 9 and 13, 2015. "On December 10 alone, 35 new records were set for high minimum temperatures all across the state, from Pactola Dam to Sisseton," Edwards said. She added that three stations tied their all-time minimum temperature for all Decembers on record: Vermilion with 49 degrees on Dec. 8; Roscoe with 35 on Dec. 9; and Selby with 36 on Dec. 9. 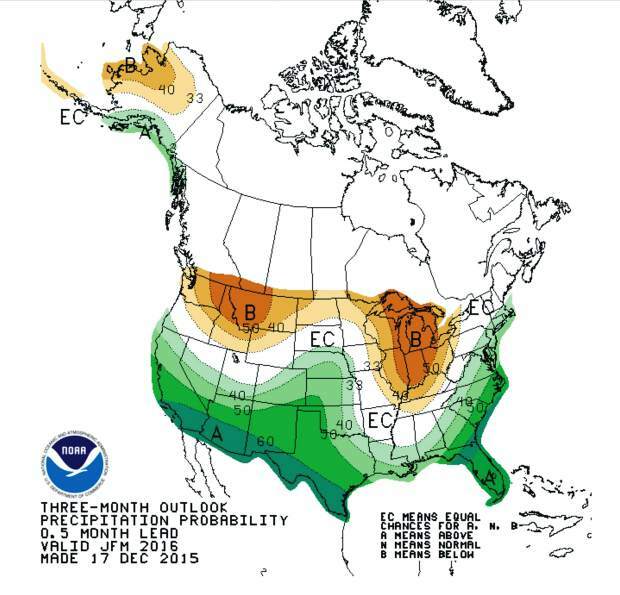 "The outlook for January and the next three months shows a continued trend of warmer than average temperatures across the northern states," said Dennis Todey, South Dakota State Climatologist & SDSU Extension Climate Specialist. "Despite a cool-down over the next couple of days in South Dakota, the region is forecast to warm up again by the end of the month. Even these cooler days are just a little below average." For precipitation, there are some increased chances of moisture to pass through our area in the next couple of weeks. "Most of the lower 48 states are favored to be slightly wetter than average, with the eastern states in the Ohio River and Tennessee Valley areas with the highest likelihood of wetter conditions," Todey said. Looking further ahead, the climate outlook shows drier conditions favored over the northern Rockies and the Great Lakes. "South Dakota again straddles a region to the north that is forecast to be drier than average, and a region to the south that is favored to be wetter than average in Nebraska and across the southern Plains," Todey said. Edwards added that the main agricultural impacts the team is watching currently include winter wheat condition and the muddy conditions for feedlot cattle. "With continued warm temperatures and wetter soils, there are muddy conditions causing some feedlot difficulties. Winter wheat is being monitored because inconsistent snow cover could expose this year's crop to frost damage if snow is not present," Edwards said.